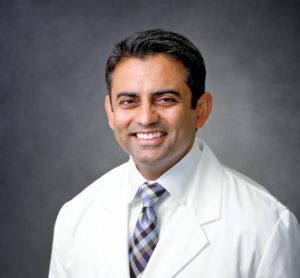 Pallav K. Mehta, MD, is the Director of Integrative Oncology at MD Anderson Cancer Center at Cooper and a 2018 Pink and Teal Hero. To him, there is no field of medicine more interesting than oncology and no greater music than old-school hip-hop. A. My family emigrated from India to the United States when I was 6 or 7 years old so I could get an education and become a doctor. My family expected that of me, but I was more interested in sports. After college, I went off the rails a little bit and worked in a gym as a personal trainer before I settled down and went to med school. Turns out – it was the right thing to do. Q. What did your parents think of that? A. Well, I was young. I had skipped 8th grade and graduated high school when I was 16 so they realized I still had some growing up to do. Q. Why did you choose to specialize in integrative oncology? A. I am an oncologist first and foremost, and find oncology is the perfect meld of the personal and intellectual sides of medicine. Yet I realize there is more to surviving cancer than just chemotherapy, radiation and surgery. Because of my background in athletics, I initially became interested in the effects of exercise on cancer. This ultimately led to further interest in integrative medicine, which encompasses exercise, nutrition and stress reduction. A. There’s actually nothing on my nightstand. All my books are on my iPad. I’m currently reading Walter Isaacson’s biography on Einstein, and I’m also re-reading “Life of Pi” because my 16-year-old-daughter is reading it for school. I’m becoming more interested in understanding religion and its impact on our lives and have a couple of books about it waiting in the wings. Q. Who’s on your music playlist at the moment? A. I still listen to my old hip-hop music and Springsteen. Of course, my kids laugh at me. A. I’m a huge stand-up comedy fan. In my mind, stand-up comics are the smartest of all entertainers. I actually have my own stand-up routine. Whenever I think of something funny, I write it down. One day, I might get up the courage to perform. Q. What else do you like to do for fun? A. I enjoy spending time with my family. My wife, Neeta, and I have three children – Isabel, 16; Aidan, 14, and Lily, 9. I met Neeta at the gym where I worked when I was 22. Just to be clear, I was not her trainer. That would have been unethical. A. The money raised by Pink and Teal for MD Anderson Cancer Center at Cooper helps change women’s lives, and when you change women’s lives, you change the world.